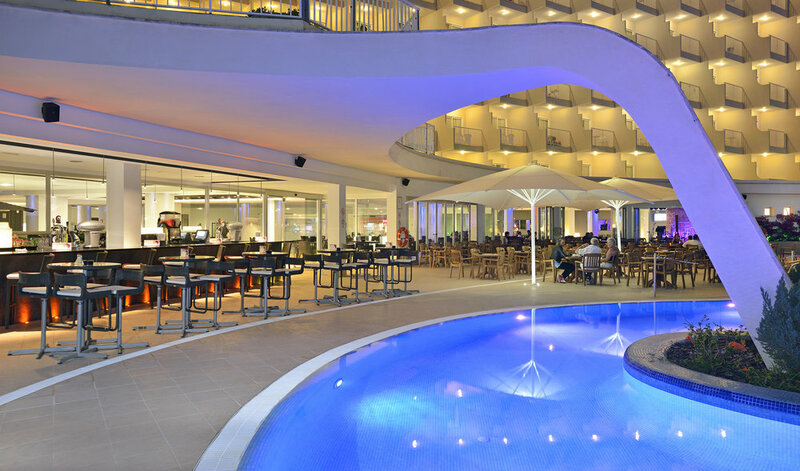 The cost-effective Sol Guadalupe is one of the most requested hotels in our portfolio of properties in Magaluf, Mallorca. The 4 star, Sol Guadalupe's bright and spacious rooms are spread over 9 floors, and have all of the services and facilities you might need during your stay. The hotel is located close to the heart of Magaluf, making it an ideal base for golfers who want to enjoy the vibrant nightlife, but without being in the centre of the resort. The Sol Guadalupe’s buffet style restaurant with its show kitchen offers a perfect breakfast to start the day. At night the restaurant offers themed buffets featuring international cuisine and local specialities. There's a great salad bar too! If you're hungry during the day, the poolside snack bar offers an ample selection of snacks and drinks. When not out playing golf you can participate in some of the many activities available at the Sol Guadalupe, such as, Aerobox, AquaGym, pool, or a even a game of table-tennis. The hotel has a lagoon style swimming pool surrounded by sun loungers, as well as an indoor pool which is heated in Winter. There's a varied evening programme with tribute acts, acrobats, magicians, flamenco dancers, live music and shows by the entertainment team. This hotel has a chic and modern feel, and is well run by a friendly management team who have helpful customer facing staff. Combined with a great location, and reasonable prices (the Sol Guadalupe is now the most cost-effective of the Sol hotels we offer in Magaluf), it's unsurprising that this is one of the most popular hotels we offer in this resort. Free Wi-Fi throughout the hotel, and a private car-park (at additional cost), make it easy for our guests to enjoy a stress-free golfing break in the sun.